The late great Arnold Small was an inveterate world birder. He was helping to popularize "birding planet Earth" (as he termed it) back in 1976 — when he wrote about seeing his 4000th world bird — at the time I was just getting started as a birdwatcher in California. Even in that article (Small 1976), he emphasized his delight in new families of birds because they were so unique and different. And the monotypic bird family that he loved the most — enough to bear its name on his California license plate — was the strange, unworldly Shoebill (left) of central Africa. Its full scientific name is Balaeniceps rex; on Arnold's license plate this was shortened to "B REX." Arnold is no longer with us, but seeing B REX has always been an important goal for me. The Shoebill, called "Whale-headed Stork" in some older literature, is a unique bird of uncertain affinities. As the old name suggests, it was once thought to be a relative of storks but its habit of flying with neck retracted and powder-down patches suggested an affinity with herons. But skeletal and biochemical evidence now show it is more closely related to pelicans (Sibley & Ahlquist 1990, Ericson et al. 2006). Some (e.g., Sibley & Monroe 1990) reduced it to a subfamily of the Pelecanidae, but their divergence was far back in antiquity. I follow the Elliott (2002) and most recent authorities in retaining it as a unique monotypic family. The Shoebill lives only in extensive papyrus swamps in the interior of central Africa, occurring locally from s. Sudan to n. Zambia. Perhaps it is most common in inaccessible wetlands of eastern Tanzania, but few of its remote habitats can be reached without difficulty. The only place it can be found with relative ease is Uganda. The Mbamba swamp on Lake Victoria holds several pairs just a half-hour from the international airport at Entebbe, and additional birds are strung out along the Victoria Nile at Murchison Falls Nat'l Park — in northern Uganda — where I took these photos. Habitat and Shoebills also occur in Queen Elizabeth II Nat'l Park. One can drive to all these sites, but often a boat is necessary to find the bird itself. I was fortunate to be with Hassan Mutebi (reachable via his "Access Uganda Tours" web site) who knew a spot on the Nile that we could drive to in a 4-wheel drive jeep, and thus approach reasonably close. Even then we had to be lucky to have it fly to a spot I could snap photos; when first discovered (photo below) it was a rather small dot in a rather large papyrus swamp. This wonderful close-up (left, a great shot by Karen Shrader) shows the incredibly broad "shoe" bill for which the Shoebill is named. The bill has a major hook at the tip to help the bird deal with its primary prey — lungfish. Although the Shoebill looks sluggish, and can stand motionless for long periods as it waits for lungfish, it does have powerful wings. It regularly soars on thermals as do pelicans and storks. 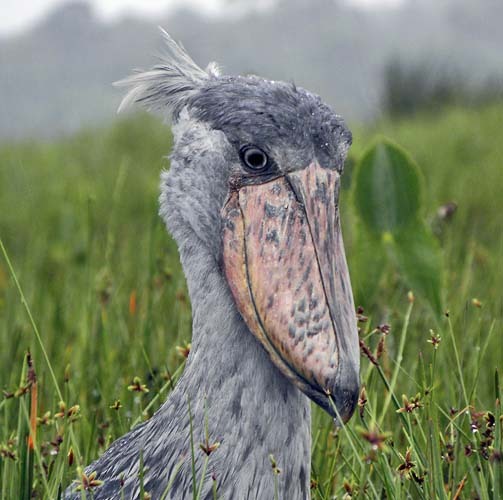 Vagrant Shoebills have appeared in many small swamps throughout Uganda, and there were records of single birds in wetlands in Kenya game reserves (Mara, Amboseli) in the 1990s. Such vagrants have sometimes stayed for a month or two, delighting tourists. Shoebills live primarily in pairs, although groups may sometimes gather at favored feeding spots. These favorite sites change over time. There was a time, for example, when Shoebills could be expected on the boat ride up the Nile to Murchison Falls itself. When I was there in July 2002, however, we saw none from that boat although other groups had seen a couple by chartering a boat to go downstream from the Paraa Lodge vicinity. We were able to drive to a site at the delta where the Victoria Nile meets the Albert Nile. Uganda has begun to appreciate its Shoebill, and the attraction it has for world birders. Injured birds are now housed at the Kampala Zoo, some of which the government had confiscated from trappers and fisherman. Postcards featuring the Shoebill are now readily available, but our efforts to find a small carved Shoebill were not successful. The Gray Crowned-Crane Balearica regulorum is the national bird of Uganda, but locals are beginning to learn that, for many, the Shoebill is even more exciting. 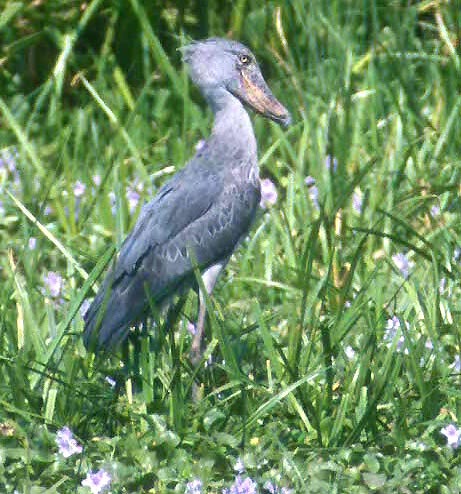 Photos: The first two photos of Shoebill Balaeniceps rex were from the Victoria Nile in Murchison Falls Nat'l Park, Uganda, on 28 July 2002. Karen Shrader took her close-up from 10 feet away, in the rain, Mbamba swamp on Lake Victoria, Uganda,in April 2010. Photos © Don Roberson and © Karen Shrader, used with permission, all rights reserved. Bibliographic note: There is no "family book" per se, but a fine introduction to this family, with some fine photos, is in Elliott (1992). Elliott, A.. 1992. Family Balaenicipitidae (Shoebill) in del Hoyo, J., Elliott, A., & Sargatal, J., eds. Handbook of the Birds of the World. Vol. 1. Lynx Edicions, Barcelona. Ericson, P.G.P., C.L. Anderson, T. Britton, A. Elzanowski, U. S. Johansson, M. Kallersjo, J.I. Ohlson, T.J. Parsons, D. Zuccon, and G. Mayr. 2006. Diversification of Neoaves: Integration of molecular sequence data and fossils. Biol. Lett. 2: 543-547. Small, A. 1976. The White-headed Piping-Guan or how I found my 4,000th life bird in Surinam. Birding 8: 145-148.